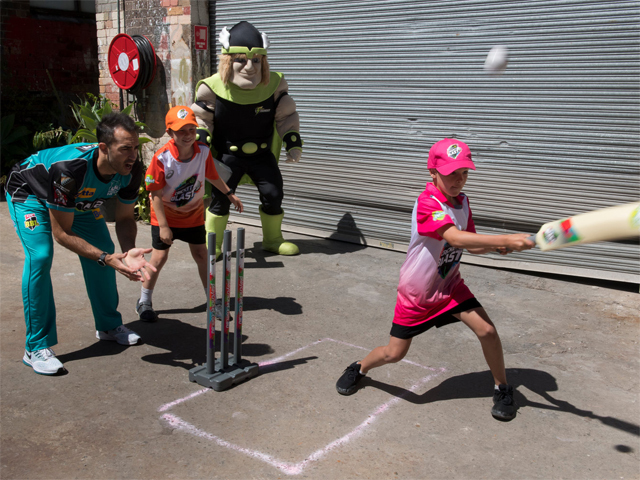 Cricket Australia announced the renewal of the partnership between global kids' entertainment brand, Nickelodeon and the KFC Big Bash League (BBL) for a third consecutive season. The renewed deal follows the success of two seasons in partnership, as Nickelodeon continues to work closely with Cricket Australia to strengthen the BBL's position as a one of the top family-friendly entertainment options of the Australian summer. The exciting 2018-19 partnership will include the roll-out of new at-match activations and gameplay featuring the Australian debut of costume characters for Nickelodeon's newly released Rise of the Teenage Mutant Ninja Turtles, a third season of the Logie Award-nominated TV series, Crash The Bash, and huge prize giveaways for fans throughout the BBL season. Nickelodeon will activate at eight BBL matches^ throughout the season beginning Thursday 3 January in Geelong when the Melbourne Renegades take on the Adelaide Strikers at GMHBA Stadium, all the way through to the BBL Final on Sunday 17 February. At the eight 'Nick-ified' matches this season, the Teenage Mutant Ninja Turtles will be giving away family trips to Nickelodeon Land at Sea World on the Gold Coast, including accommodation at Sea World Resort. Fans will also compete in fun-filled challenges on the field-of-play during innings breaks, while Nickelodeon's 'Nick Squad' will be making a comeback to entertain families off the field with inflatables and water play activations to keep kids cool throughout the day. There will also be an opportunity for one lucky family to win an exclusive trip to New York City at the BBL|08 Final. The incredible prize includes return flights to New York City, five nights' accommodation and a variety of family experiences to enjoy. Cricket Australia Head of Big Bash Leagues, Kim McConnie said: "It's a pleasure to be partnering with Nickelodeon for the eighth season of the KFC BBL. "This summer, more fans will be able to enjoy the fast-paced on-field action than ever before, as the competition moves to a full Home and Away fixture. "We believe this will be one of the most exciting BBL seasons to-date and we look forward to working with Nickelodeon once again to deliver more fun and enjoyment to our fans across the country"
General Manager and Vice President of Nickelodeon Australia and New Zealand Ben Cox said "We are thrilled to once again be partnering with the BBL to provide blockbuster kids entertainment both on and off the field. "Nickelodeon's mission is to make the world a more playful place and we are excited to be giving kids around the country the opportunity to experience our brand in new and irreverent ways"
Logie-nominated TV series, Crash the Bash will again return for a third season with a female new co-host set to join the former cricketer and Australian Survivor finalist, Lee Carseldine The wacky show designed for kids will be aired on Nickelodeon across the summer and features exclusive behind-the-scenes BBL action including epic sixes, world-class catches and stubborn seagulls. Crash the Bash will premiere on Nickelodeon, Saturday 12 January between 7am – 10am, until Sunday 17 February. Full episodes of Crash The Bash will also be available on Nick Play after they premiere on TV. New episodes of Rise of the Teenage Mutant Ninja Turtles will be aired throughout the BBL|08 season on Nickelodeon and the new character costumes will appear for the first time in Australia at the eight 'Nick-ified' matches. General Admission prices for the upcoming BBL season remain unchanged for the eighth consecutive year, with adult tickets from $20, kids tickets from $5, and family tickets from $42.50*.